We are really talking about the fundamentals of life on this earth; the elemental problems of safeguarding the food we eat, the fuel we consume, the transportation to maintain a steady flow of commerce, an intricate telecommunications system which will continue to function under all conditions, and perhaps most important, the foundation of constitutional government which underpins our way of life. These are the things that concern the OEP. While its area of concern was potentially limitless, the OEP approached this vast array of “things” in a distinctive way: as a collection of critical and interdependent systems to be safeguarded against the catastrophic disruption of nuclear attack. In this essay, we briefly describe how, from the mid-1950s to early-1960s, experts and officials charged with preparing for nuclear catastrophe in the United States sought to manage “the fundamentals of life on this earth” by producing a new kind of knowledge that focused on risks to the critical systems that underpinned collective life. The mission articulated by McDermott was the outcome of a series of discussions and debates that took place over the course of the 1950s among lawmakers, bureaucrats, military planners and technical consultants about how to plan for thermonuclear war. In the wake of the first Soviet H-bomb tests in the early 1950s and in anticipation of the development of intercontinental ballistic missiles, Cold War defense strategists turned their attention to a novel problem: the protection of the nation against a devastating surprise attack. They argued that the traditional emphasis of civil defense on problems of urban preparedness – emergency response, evacuation, and the restoration of local services – was now obsolete. The prospect of a thermonuclear attack heralded destruction on a previously unimaginable scale. Many American cities would be entirely destroyed. Radioactive fallout would make vast areas of the country uninhabitable. The very future of the United States as an economic and political entity would be in doubt. How could one plan for national survival under such circumstances? A group of thinkers with backgrounds in fields such as strategic bombing theory, mobilization planning, and systems analysis, with access to new computer technology for amassing and processing large amounts of data, offered one response to this challenge. These experts were located both outside of government – in think tanks like the RAND Corporation, the Stanford Research Institute, and the Institute for Defense Analysis – and in key government offices such as the Federal Civil Defense Agency and military research organizations such as the Naval Radiological Defense Laboratory and the Strategic Assessment Committee in the Office of Defense Mobilization. While they did not speak with one voice, there was an emerging consensus in the mid-1950s that it was necessary to focus, in advance of nuclear war, on the vulnerability of the systems that undergirded collective life: energy networks, industrial facilities, transportation infrastructures, and communications systems, as well as the personnel who operated these systems. Using digital computers, they invented techniques for analyzing collective life as a complex of these vital and vulnerable systems; for modeling how these systems would be affected by nuclear war; and for planning measures that would reduce vulnerability and prepare the government to manage the economy and polity after a nuclear attack. This was not the first time that the management of the critical infrastructures and industrial systems that comprise modern economies had been taken up as a central concern of military planning. In Europe and the United States, World War I had been a watershed for state-based economic planning in the interest of war mobilization. And in the United States, the War Production Board during World War II and the Office of Defense Mobilization during the Korean War invented various techniques of economic intervention as part of war mobilization efforts. In these agencies, war planners drew on new technical methods such as linear programming and matrix algebra to model the US economy as a complex of interdependent “activities” and to rationalize the allocation of scarce resources among competing priorities. The experts and government officials who testified at the Hearings were preoccupied with gaps in the knowledge that would be required to manage the economy after a nuclear attack. Consider, for example, the testimony of Arthur Flemming, the head of the Office of Defense Mobilization – the organization most centrally involved in planning for national survival in the mid-1950s. Flemming told the Committee, “we are concerned over the lack of basic information [about] those items essential to survival following a bomb attack. All of those items … must be planned for in advance, requirements determined, stockpiles built up if necessary, and vulnerability to attack lessened to the extent possible.” The existing knowledge practices of mobilization planning provided a starting point. On the basis of information collected by the Department of Commerce, the Department of the Interior, and the Census Bureau, ODM had recorded on computer tapes a vast amount of information about the US economy and population: “the precise location, shipments and employment of approximately 20,000 manufacturing plants in target areas; the 400 largest electric power generating stations; producers of the most important military end items and the principal elements and components and subassemblies of these items; principal airfields and military supply depots; the stockpile of strategic materials; and the United States population in 25,000 locations.” Using the new technical possibilities of “electronic calculators” like the Univac computer mobilization planners were able to assess the vulnerability of individual assets to nuclear detonations. ODM led an interagency program that was “responsible for developing and maintaining a system for the assessment and reporting of attack damage and the impact of various patterns of attack on all segments of the mobilization base, including industry, manpower, telecommunication, transportation, and other mobilization resources” (ibid). This damage assessment center, equipped with powerful electronic computing equipment, was used to plan “hypothetical attacks against many targets in the United States and to compute the overall physical damage, radiological contamination, and casualties that can be expected” (ibid). The crucial idea articulated here by Flemming is that production systems had properties that could not be understood by looking at the simple aggregation of their parts. Rather, one had to analyze the interconnections among these systems. Here, in the space between an isolated economic activity (such as the assembly of warships or airplanes in a specific factory) and a “chain of production” – between damage to individual facilities and systemic effects – we can see the emergence of a new way of thinking about and managing the US economy in the wake of a nuclear catastrophe. Another expert who testified at the Hearings, operations analyst Walmer E. Strope of the Naval Radiological Defense Laboratory, described how one might use information about the vulnerability of industrial systems to plan for national survival in the wake of attack. Strope described a hypothetical case of a dry-dock for ship repair that could withstand fifty pounds per square inch of blast pressure from a nuclear detonation, but that depended on a nearby power plant that was rated to only five psi. The greater protection of the dry-dock was “useless,” he reasoned, “when the power plant would be destroyed.” This type of “weak-link” analysis could be applied “not only to the plant or installation, but to the whole target area, and ultimately to the whole nation.” And indeed, over the course of the late 1950s and early 1960s, a number of government agencies as well as think tanks began to produce knowledge about vulnerable systems on ever-larger scales. For example, in 1960, under contract with Office of Civilian and Defense Mobilization (OCDM), the successor to ODM, the Stanford Research Institute completed a study on “The Effects of Nuclear Attack on the Petroleum Industry” that examined the national “petroleum pipeline system” as an “integrated network of pipes, pumps, working tanks and controls.” The study assessed not only the “vulnerability of the separate components of this system but also the “effect on over-all system operation caused by the loss of one or more components,” and the likely reciprocal effects on interrelated systems such as electricity production and distribution that would themselves be damaged in a nuclear attack. The National Planning Association engaged in an even more exhaustive modeling procedure under a contract signed with OCDM – which was reorganized in 1961 and renamed the Office of Emergency Planning (OEP). The result of this effort was a computer program called PARM (Program Analysis for Resource Management), a massive system for modeling the effects of nuclear attack by analyzing thousands of interlinked economic activities that, together, comprised the entire US economy. By the early 1960s, a new form of knowledge about American economic and social life had been consolidated within the agencies charged with preparing for thermonuclear war. With the aim of mitigating the vulnerabilities of the nation’s vital systems to sudden and catastrophic attack, strategic planners quantified and analyzed the interrelations among distinct economic activities. Such expertise in system vulnerability would have a long career, in domains ranging from natural disaster, to terrorist attack, to pandemic disease, to economic crisis. Civil Defense for National Survival. Report of the House Committee on Government Operations. Washington, DC: US Government Printing Office, 1956 (hereafter, CDNS), p. 16. Civil Defense for National Survival. Hearings of the Military Operations Subcommitee of the House Committee on Government Operations. Washington, DC: Government Printing Office, 1956, p. 1080. Seventh Annual Report of the Activities of the Joint Committee on Defense Production. January 16, 1958. Washington: US Government Printing Office, p. 7-8. Civil Defense for National Survival Hearings, 1040. Thus, in reference to Strope’s example, Civil Defense for National Survival noted that “[i]n principle the requirements do not differ as between civilian and military targets. Protection of the shipyard workforce and facilities in, say, Long Beach California, and protection of the resident population are part of the same problem” (CDNS, p. 19). 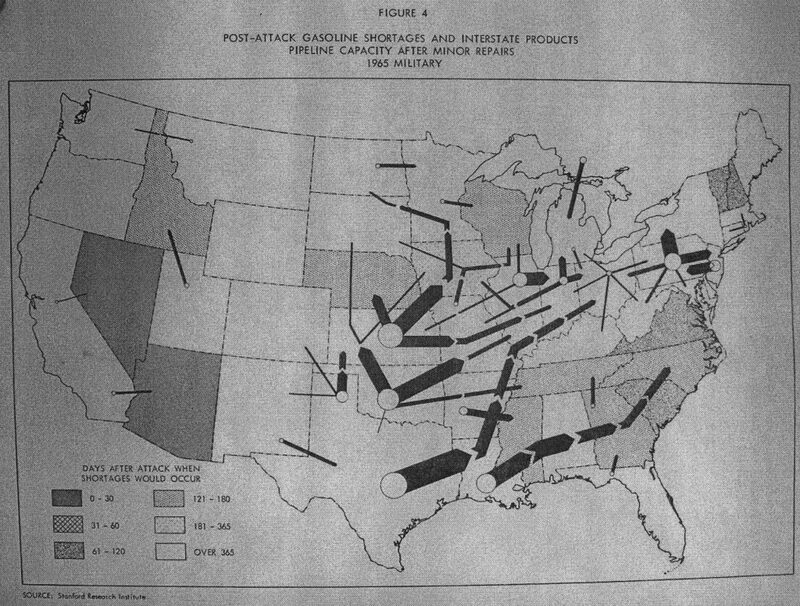 Sanford B. Thayer and Willis W. Shaner, “Effects of Nuclear Attacks on the Petroleum Industry.” Stanford, California: Stanford Research Institute, 1960. See Onur Ozgode, “Logistics of National Survival,” Department of Sociology, Columbia University, 2008.